Barcelona is the capital and cultural centre of Catalonia and with 1.6 million inhabitants it is the second largest city of Spain. 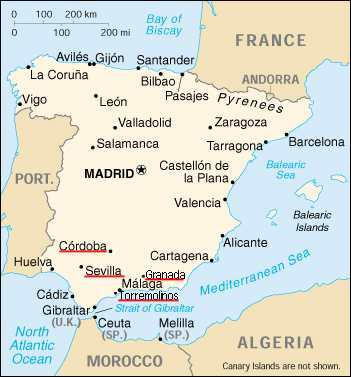 Moreover, this marvellous city on the Spanish Mediterranean coast is an important industrial and commercial centre. The city’s history began over 2000 years ago, in 133 BC with a Roman colony which the emperor Augustus later called Barcino, and which in the Middle Ages turned into Barcinona. In the course of its changeful history, Barcelona was conquered by the Visigoths, the Moors and the Franconias, .fell to the Kingdom of Aragonien in 1137, belonging then to the Spanish Crown and was, in the 18th century, temporarily occupied by French troops. Thus the city developed, under the most varied cultural and political influences, into a cosmopolitan and cultural centre. Barcelona is a charming city. The multi- faceted townscape, which presents an abundance of architectural masterpieces from different epochs – elegant boulevards and squares as well as lovely parks and castles – is enhanced by its picturesque situation by the sea, set against a background of the Coliserola mountain ranges. Surrounding hilltops offer spectacular views over the city. Also the coastline with beaches, promenades, and in particular Port Vell, the old harbour, and the works by the Antoni Gaudi , are special highlights for every visitor. Antoni Gaudi (1852 – 1925) was an architect of incredible ingenuity and creativity and contrived highly original designs. Nature was of the utmost significance for him (“Everything comes from the book of nature”). Characteristic features are curved lines, the parabolic arch, irregular ground plans, diagonal buttresses, colourful mosaics and nature orientated motifs, often from the marine world. His architectural style is classified as Modernism, a Catalan variety of Art Nouveau – unique and unmistakable. 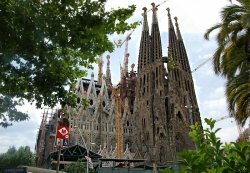 Seven of his works are on the world heritage list of the UNESCO The most famous of his works is the still unfinished church Sagrada Familia (Holy Family) which became the landmark of the city. In addition Casa Mila (La Pedrera), Casa Batllo and the Park Güell are a MUST if you visit Barcelona. In the Gothic Quarter (Barri Gotic), the historic Old Town, numerous beautiful medieval cultural monuments can be found, such as the cathedral of the Holy Eulalia, the Placa del Rei (King's Square) with its arcades and palms, the Frederic Mares Museum and the Ajuntament (City Hall). La Rambla (“Street to the sea) is a 1.2 km long tree lined pedestrian mall which leads from the centre through the old part of the town up to the Christopher Columbus monument at the old harbour, Port Vell. It is the emotional hub of Barcelona and usually full of life. In diifferent sections florists, dealers selling birds and small animals, painters, road artists and of course lots of mimes can be found. ; also open air cafes and restaurants where one can pause for refreshment. In the Rambla there are also plenty of shops, the well known market, Mercat de la Boqueria, and the world famous opera house Gran Teatre dei Liceu; further la placa del Rei can be accessed from there. 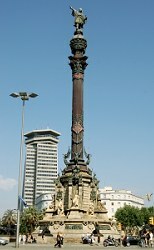 The Rambla leads into the Placa del Portal de la Pau, in the middle of which is a statue of Christopher Columbus. There are also the medieval royal shipyards, the Drassanes, which accommodate today the naval museum, the Museu Maritim.